How does an Octopus Use Ink to Defend Itself Against Predators when Threatened and is it Poisonous? 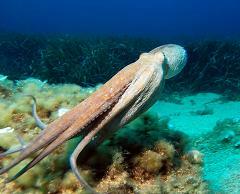 When an Octopus is threatened by a predator it will squirt ink, change skin color as camouflage, and jet away. As good a job as the ink does of hiding something as hard to hide as an octopus, it’s also poisonous to some creatures and stuns others, even when diluted in the vastness of the ocean. How poisonous is the ink? If released by an octopus caged in an aquarium, the ink would kill everything inside the glass walls, including the octopus itself. Most octopuses have no internal or external skeleton, allowing them to squeeze through tight places and escape. They are also highly intelligent for an invertebrate. How Else Does an Octopus Defend Itself From Other Animals Besides Shooting Ink at Predators? Where does the word “ink” (encaustic) come from and What does ink mean?